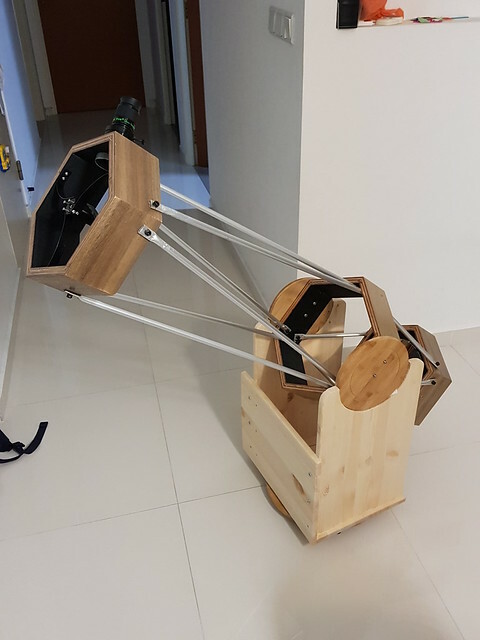 Made a planetary scope from a bunch of shelves, some plywood, and a GSO mirror. Balances very well, and seems to have pretty good mechanics. Can't wait to test it out soon! Adventures in recycling...haha. Nice scope! Maybe can get Ikea into the Dob business too. hmm so the hex things were the ikea shelves? i have a lot of trouble cutting angles into plywood to make those hex shapes.. what i did before was a box. Good to see you have done it. I am a beginner and want to buy a dob 6 inch but find it too heavy and expensive to import here. It costs about $650 to bring in from bh for a skywatcher. I wonder why an 6 inch dob needs to be heavy like 18kg. The mirror is only about 1kg. I am thinking of building a light weight version where i can bring for travel. what online shop do you buy your GSO mirror? What is the total weight of your assemblied Dob telescope?